Gardening can be a very therapeutic pastime, but if you don't know what you're doing, you can do more harm than good to your plants. One may think the most difficult part of gardening is deciding what types of plants you want to purchase, but it's actually knowing what type of soil you're working with. After you figure out what soil is in your plot of land, you can get started. Clay soil is a heavy type of soil that has high nutrients, is made of over 25 percent clay and holds a lot of water. This type of soil stays wet and cold throughout the winter, but it dries out in the summertime. Gardeners often don't like to use clay soil because it takes a long time to warm up in the summer. After warming up, it dries out quickly and cracks. Sandy soil is light, warm and dry. It's more acidic than other soils because it has a high amount of sand in the composition. It also has a small amount of clay. People tend to like sandy soil because it drains water quickly, so it's relatively easy to work with during the spring. In the springtime, it warms up quicker than clay soil, but just like clay soil, it dries out in the summer. This type of soil doesn't provide a ton of nutrients because, due to its quick water drainage, it washes away. Most gardeners combat this loss by mixing in organic products to help give the soil more nutrients. Silt soil is light, holds a lot of moisture and has a high fertility rate. It has medium-sized particles, which allows water to drain. The only negative thing is that the medium-sized particles are super fine, so it's easy for the soil to wash away when it rains. In order to rectify this, gardeners add in organic matter that allows the soil to become more compactable. Peat soil is high in organic matter. This type of soil, though, is hardly ever found in gardens, which is why gardeners add it to their soil. Peat soil holds moisture well and is considered in the upper echelon of soil bases for planting. Chalk soil can be light or heavy. Due to the concentration of calcium carbonate or lime in the soil, this makes it very alkaline. The alkalinity of the soil doesn't support the growth of ericaceous plants. Ericaceous plants are acid lovers or lime haters. They won't grow in high pH soils like chalk soil. Examples of these types of plants include rhododendron, camellia, azalea, Pieris, summer-flowering heathers (Calluna) and Japanese maples (Acer). Although there are a lot of plants that prefer a more acidic environment, you can find plants that prefer alkaline soil like the lily, iris, bluebell, crocus, geranium, hyacinth, maidenhair fern, morning glory, poppy and daisy. Vines also thrive in alkaline soil. Examples of vines that like alkaline soil include honeysuckle, clematis and Boston ivy. Loam soil is a mixture of sand, silt and clay. The combination of all of these soils negates the negative properties of each type. By combining these soils, loam soil is very fertile and easy to work with. It also has good drainage. 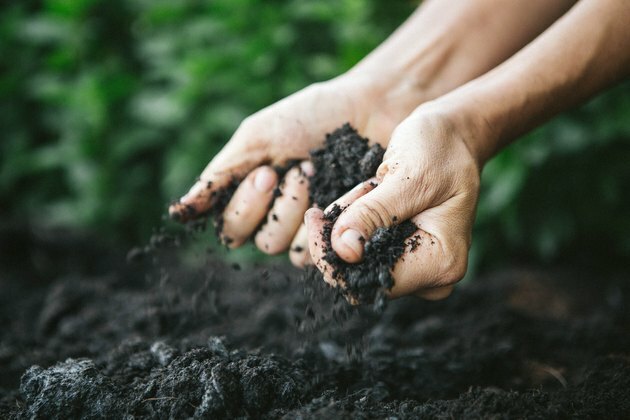 Gardeners love the mixture of sand, silt and clay, but they still add organic matter into the mix to provide the optimal environment for their plants. Can Potting Soil for an African Violet Be Used for Other Plants?